My wife had eaten on her own earlier, so I made a simple but filling capelinni (angel hair) pasta with vegan sausage on the side for my daughter and myself. My Dad chose another simple dish that I prepared for him. Nowadays, I don't typically use oil in my cooking, but do like to use a tiny bit when I cook with tempeh or seitan. Tonight, I was remembering our visit some years ago to Italy, and how much I like the simple dish of green beans and onion briefly sauteed in a little bit of olive oil, then served with lemon juice, salt, and pepper. I couldn't resist, and made the green beans, using maybe 1/2 T or less of oil. For the main course, I wanted to cook with lacinato kale, and thought I'd try mixing in some sweet ingredients, such as raisins, as well as chunky nuts. 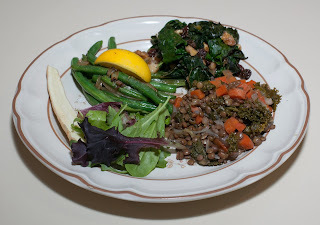 I also had leftover greens with brown lentils from two nights ago. I also served a half parsnip and some spring greens. 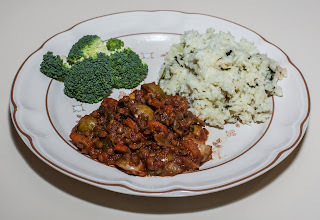 Here is how I made the main kale dish. I put the walnuts into a stainless steel saute pan, turned the pan up to medium, and stirred the walnuts for about 5 minutes till they gave an aroma and were just showing signs of starting to darken. Walnuts should not be burnt and should be watched carefully. I removed the walnuts from the pan and put in the onion, also on medium heat. I stirred occasionally for about 2 minutes till the onion was becoming clear. I then added the kale and cooked it down for about 3 or 4 minutes till all the leaves became a darker green. I added the tangerine juice and pulp, as well as the bouillon cube, and mixed, then added the shallot, raisins, and jalapeno. I cooked just for a few more minutes, being sure that the kale didn't cook down substantially. I sprinkled on the salt and served. We all loved the kale! I don't do it often, but it's fun to cook with sweet and savory ingredients together. The tangerine flavor was a very nice complement, too.The green beans were, as always, great. It was fun having a little bit of oil for a change. My palate has changed so that the little bit of oil was feeling rich. The leftover greens were good. I typically cook with no added fat, but as a little accent, tonight's meal still wasn't bad. A walnut has about 2.6 g of fat so that contributed 26g. Olive oil is 14g of fat/T, so that was another 7g. Divided amongst my wife, Dad, a little serving for my daughter, and me, that is probably about 9g or so of fat per serving, which is good. I should try more combinations of greens or broccoli with a modest amount of nuts and citrus juice. Pistachios would be great! Merry Christmas! In the afternoon, my five-year-old daughter helped me to make a nice batch of big oatmeal raisin - chocolate chip cookies. I modified a recipe that I found online by slightly reducing the raisins and adding a bit of fair-trade organic (in fact, all the ingredients were organic) chocolate chips, plus walnuts and the zest of one organic tangerine. The cookies were quite good! Tonight for Christmas dinner, my wife asked me to use up a package of greens that she had. I decided to cook lentils and greens as a main dish. I love artichoke hearts and had picked up a favorite packaged one yesterday. I was looking forward to making a pasta dish with the hearts, and did that as well. I got a large stock pot with water and a vegan bouillon cube boiling then added the lentils. Brown lentils usually take a 1:3 ratio of water and cook over 30-45m; I just used ample water since additional ingredients were going to be added. I didn't cover the pan. Approximately a dozen artichoke hearts. I use a 6 ounce package of "natural" ArtiHeartsTM but prefer their grilled varieties. I thought I'd use a plainer variety because of my daughter's preferences. One can steam artichokes and use their hearts or buy (not very tasty, in my opinion) canned artichoke hearts. I got a medium stock pot with water and a vegan bouillon cube boiling then added the noodles. They're great to work with as they only take 4 or 5 minutes to cook, have a nice texture (though I heard that when cooking in large quantities, rice noodles may get very soft and start to dissolve away), and are gluten-free, great for those who want to avoid gluten. I also added the artichoke hearts. They came cooked, but I just wanted to warm them, so let them have the 4-5 minutes of being in the boiling broth. When the noodles were done, I drained them, added the raw tomato, nutritional yeast, salt, and hemp seeds, and served. I loved the pasta but, alas, my wife wanted some hot sauce and salt, and still thought it was good but not great. My Dad seemed to enjoy the noodles, and we all liked the greens and corn. I really liked the combination of noodles and artichoke hearts and would like to try additional ingredients like bell pepper and maybe green peas sometime. This would be even better with fine mai fun rice noodles or angel hair, allowing the artichoke to be a bit more dominant. The greens were good; a little bit of potato or sweet potato could be a nice addition. Unfortunately, I wasn't able to enjoy Thanksgiving this year, though I organize the country's largest vegetarian Thanksgiving (we had over 600 people on Thanksgiving Day and almost 200 at a pre-Thanksgiving feast!). I have a condition where I periodically pass a kidney stone - thankfully, most of the time it's not very painful. I seem to have started passing a stone the day before Thanksgiving, which kept me with very little appetite and a lot of fatigue. I ended up at my doctor's, urgent care, and spent a night in an Emergency Department. Ever since I became vegan more than 10 years ago, I very rarely get sick, but the stone episode must have weakened me, as I moved seamlessly into a bad flu. My wife has been cooking very simple meals; all I've been eating is a lot of watermelon and small servings of white rice with spices, maybe some Indian kichedi (turmeric and rice), or white pasta with a little bit of sauce. I've lost about 8-9 pounds but started feeling better 2 or 3 days ago; finally, today my appetite is starting to come back, too, and I've not been averse to being around food. Surprisingly, the idea of raw foods has been unpalatable, and only today is that starting to change. Anyway, I was so excited to return to cooking today! I used white rice and just a little bit of raw food (broccoli). Here is what I did. Medium leek. Leeks by nature tend to be quite dirty with dirt easily getting lodged in between the leaves, so it's critical to clean them well. Here is what I do. I cut off the roots and, at the other end, any browned or hardened leaf ends. I wash then cut the leek in half the long-way, and rinse again. Then I cut the leek into discs (actually half discs since the leek has been cut) about 3/8" thick and put the half discs into a bowl which I can then rinse thoroughly. I like the flavor of leeks but if the idea of cleaning a leek is a little daunting, then a small or medium onion cut into 1/4" cubes can be substituted. (Optional) 4T Broccoli stalk cut into fine cubes less than 1/4"
In a medium stainless steel pan (I use titanium-stainless steel pans from Saladmaster, which I love), I added the carrot and Brussels sprouts. I don't usually cook with oil so preheating isn't necessary. I then turned the pan on medium and stirred the vegetables for about 2-3 minutes until the carrot started giving out a nice fragrance. I then added the leek and cooked another 5m or so till the leek, as well as other vegetables, were softened a bit. I then added the French lentils and water. Normally, French lentils are cooked in a 1:3 ratio with water or broth for about 30-45m. I wanted to also use stewed tomatoes, but didn't have any. If I did, I would have ideally put in twice as much water and the same amount of tomato as the lentils. Instead, I used tomato paste which, of course, isn't liquidy. I also added the bouillon cube and salt (I use Rapunzel brand salt-free cubes). I don't use much salt in my cooking, but often when I cook with tomato, I like to use some salt to temper the tomato. Also, my Dad, who normally lives with my brother in California, is visiting for about a month, and enjoys salt. 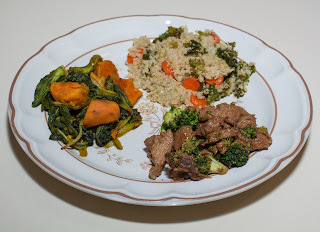 I happened to be serving broccoli on the side so, instead of composting the stalks, added them as well for a bit more flavor to the main course. I also made a white Basmati rice. I normally use brown rice (much more nutritive and tasty), but want to stick with white rice for a bit since I haven't been feeling well. I use a ratio of 1 1/2 or 2 parts water plus a bouillon cube to one part of rice. I used 2/3 or 3/4 cup of rice and also threw in a dash of salt and a dozen baby spinach leaves. My Dad, wife, and even my daughter all enjoyed everything! The main course was very good, but I would make it with less tomato next time. The stewed tomatoes would have been a tastier choice than the paste. I don't add hot pepper nowadays because of our preschooler, but 1/2 t or so (to taste) of a hot chili powder would go well. A little bit of nutritional yeast could also be added. My appetite still isn't fully back. I ate a small serving - there was plenty left to send some for my daughter's lunch and also pack some for her two teachers to try tomorrow. I hope that they'll like the dishes! I would enjoy making this again with stewed tomatoes. Some fingerling potatoes, cut in half and sauteed with the other vegetables, would make for a nice dish. It's been a long time since I've made risotto, and I'll bet I could make a risotto with Brussels sprouts and leek. I wonder what risotto would be like with lentils mixed in. I should more commonly cook with broccoli stalk; it adds just a little flavor and is better to use than compost so we get the nutrients.